Of course, we didn't follow the directions exactly, and I ran out of time and didn't make the jacket. I am now in search of a yellow cardigan (looks straight at Cardi - "May I wear you please??") to cover my flabby arms. It is kind of depressing to compare myself today with Penga of last year. There's about a 15 pound difference. No one to blame but myself there, haha. 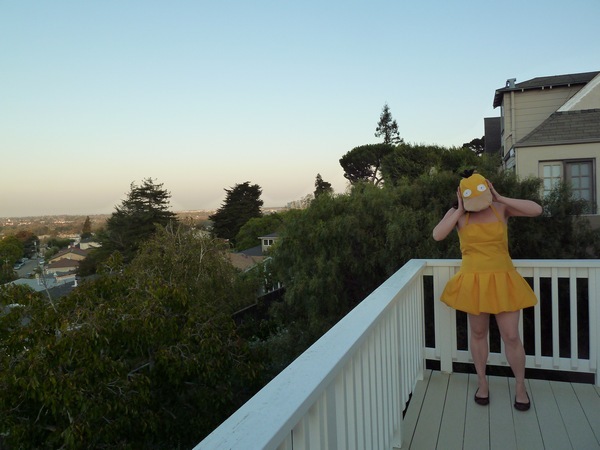 I also need to find some yellow leggings, though I do have a brown pair if yellow isn't possible. I don't want to accidentally moon my guests, and I hate having to remember to be lady-like while lounging around on the couch. Any leads, shoppy ladies? 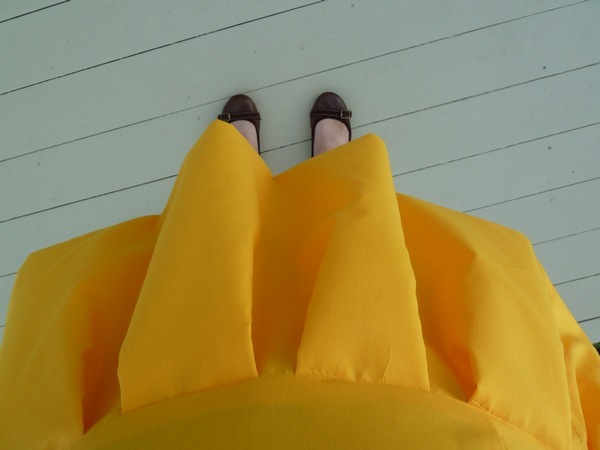 When my gather stitch thread broke while putting the skirt together, we decided to pleat the whole thing instead. Easier, really. And I totally have to use fashion tape on the top since my chest shows when I bend over. I don't know if that's the fault of the pattern or myself, but will probably err on the side of bad-sewing. Overall, I really like the dress. It's bouncy and fun to hop around in. 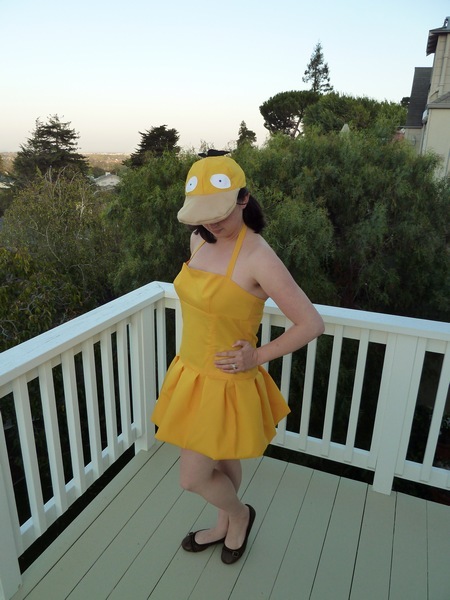 The material is super cheapy (broadcloth - which translates to "the least expensive stuff in the fabric store"), but I still think it's better quality than a store bought Halloween costume. I will definitely save for future conventions, and hopefully duck it out a little bit more in the meantime. I could use a blond wig, and a tail, for instance! Man, you guys are soooo crafty!! I love it, you're so cute! This is such a cute costume! I think you look great... Hmmm, yellow tights? There are a bunch of hosiery stores on Haight Street that might have some. I think one of the stores is called New York Apparel. Good luck! You would probably be able to find appropriate tights or leggings at American Apparel - they have all kinds of colors. Awesome! You are totally rockin the outfit in the second pic! too cute! way too cute! american apparel is a good suggestion for the tights/leggings! @erin & pug - thanks for the suggestion! Is american apparel really expensive? Ill go to union square on my lunch break today. @kim - hosiery is a good idea. Probably much nicer looking than leggings! Ohhhhhhhh my gosh, your yellow dress is SO cute! Your costume is ADORABLE! I saw some cheap, colored tights in Forever 21 the other day, I think yellow would be easy to find there (I believe I've actually found them there once in Japan but they are long gone). Or Claires? Super cute!! :D I was going to suggest F21 but didn't find any yellow ones online. Seriously! I think I went to a bajillion stores today guys. Yellow is decidedly not in "season". They had a few yellow cardis at F21, though not in my size (booo). I found a jersey-knit shawlish jacket on a clearance rack at Macy's though. Still looking for yellow tights. They had them at Claires, but once again, not in my size. :P Thanks for all the suggestions everyone!! When I am looking for something specific at the mall it is never there :( Good luck in your search! Target maybe?